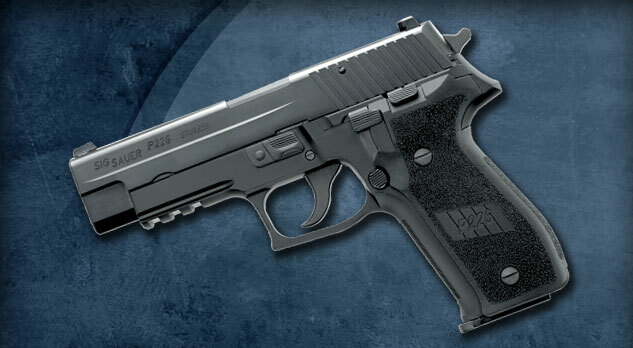 The SIG-Sauer P226R is a variant of the SIG-Sauer P2260 series, the primary modification being a rail on the underside of the frame, forward of the trigger guard. This gun is the standard P2260 model that is used by the U.S. Navy, Federal Agents, and Texas Rangers. The gun is typically available in 9mm, .357, or .40 S &W. The weapon has a capability of 15 rounds per magazine in the 9mm, and 12 rounds per magazine in the other calibers. make up Ken Wheatley‘s men during the 2018 expedition to Isla Nublar. 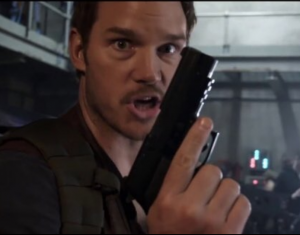 As the mission to capture Blue goes sideways, the Velociraptor attacks one of the mercenaries, causing the man to fire his weapon at the animal, seriously wounding it. Zia in a standoff against Wheatley. shoot him in retaliation. However, the standoff was a short lived one, as she was outnumbered. She was able to use the situation to be able to convince the mercenaries of her usefulness in healing Blue. Owen with a P226R weapon, as seen in the BTS. Later, Claire Dearing and Franklin Webb were trapped in a sinking Gyrosphere and had no other option to escape, when Owen came to their rescue. Having procured a handgun of his own, Owen fired it at the Gyrosphere glass twice, creating holes which let the water in. He was forced to seek an additional alternative to the rescue of the pair as he dropped the weapon due to falling debris from the volcano.